It has already started the registration process for applying for assistance Catalan SMEs that want to internationalize. You're a Catalan SME and want to get started in exporting? Until the 30 September 2017 It has opened the process of submitting proposals for Catalan SMEs internacionaltzació. 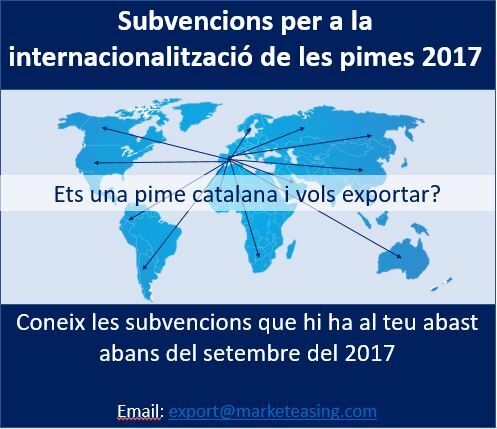 If you are a Catalan company, which last year exported no more than 15% of its turnover, Contact us export@marketeasing.com you do a project that suits you and subsidized a 80 % by the program. Now, Catalan SMEs have no excuse not to start exporting.